Brewers Counter CC Signing With Trot Nixon ~ The Bucky Channel - The World of Sports from Wisconsin's Perspective. 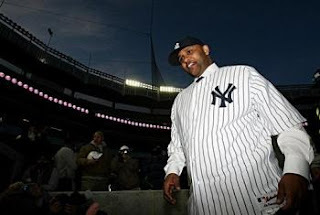 Sadly, CC Sabathia in pinstripes actually looks pretty natural. Not as natural as him in a Brewers retro, but it still looks like it fits. But that's probably only because we've seen this coming long before he did. Sabathia was introduced today by the New York Yankees, proclaiming that he's "all-in". You know, kind of like how Doug Melvin said that the Brewers were "all-in" went they traded for Sabathia. Nice line there, Carsten. So with the Yankees outbidding the Brewers for Sabathia, and then seemingly breaking off all Cameron-Cabrera trade talks, how can the Brewers possibly stay competitive? Well, how about with the Gabe Kapler-esque signings of Trot Nixon and Chris Duffy. Nixon is a 34-year old left-handed outfielder who had just 41 plate appearances with the Mets last season, while also spending time in the Diamondbacks minor league system. Duffy is also a left-handed outfielder who will likely overtake Tony Gwynn Jr. on the depth chart. The always reliable Bernie's Crew breaks down the signings a little further. It's still early, but I'm already starting to fear that the Brewers aren't going to make too many big moves this offseason. Maybe a Joe Crede here, a veteran pitcher there, but nothing too spectacular. And now with Cameron looking like he'll stay a Brewers, I'm not sure where they are going to find the money to even make a splash. I'm glad you said the Nixon & Duffy acquisitions were Kapler-esque. One's a veteran who's shown quite a bit on the field & the other has a lot of potential. Both could play their way into the leadoff spot in the lineup. Neither is a flashy pickup but then again neither was Kapler, Kendall, Turnbow, Kolb, etc. Finally we're mixing in some contact hitting lefties. Meanwhile, I say either will be hard-pressed to even make the team. We shall see.